I feel like it’s been so long since I’ve posted anything…I miss you guys. Even though I have A to Z posts going up every day, I haven’t written anything in a long time. I have the entire alphabet already scheduled so I could technically get kidnapped and no one would notice until the end of April. The main reason for this is because I’ve just been so gosh darn busy!! After Easter weekend (which was FABULOUS btw – two birthdays, plus getting to shoot a compound bow in my backyard), the rest of the week was bananas. I got my bed into Toronto and half set up. Then on Tuesday, I found out that I could move into my new suite. Wednesday was spent taking about 20 trips from one side of the house to the other. I have unpacked just enough to start living a normal life. But the office is just full of boxes and suitcases. Thankfully, I can just close the door and ignore it. Because I have doors now! Not just one bedroom, but a bedroom, bathroom/laundry room, office, and a sitting room/kitchen. Once I get unpacked I’ll get some pictures up for you guys. Then at work, since I missed an entire weekend, I walked in on about 7 baskets of laundry Tuesday afternoon. Which generally isn’t a problem after a long weekend but I also had to do kid shuttling that evening as well. So when that happens, I lose 4 hours out of my day. I love going to karate with the kids and we had a super awesome time (2nd even said “T, I had a lot of fun today!” when we got home that night), and then I was on French tutor duty on Wednesday which meant another loss of 4 hours. Each night staying late to just try to catch up on the never-ending pile of dishes that awaits me in the kitchen. Of course, I also had the other house light cleaning to take into consideration. And a full clean of my old room so that it wasn’t a dusty mess. And now it’s snowing. 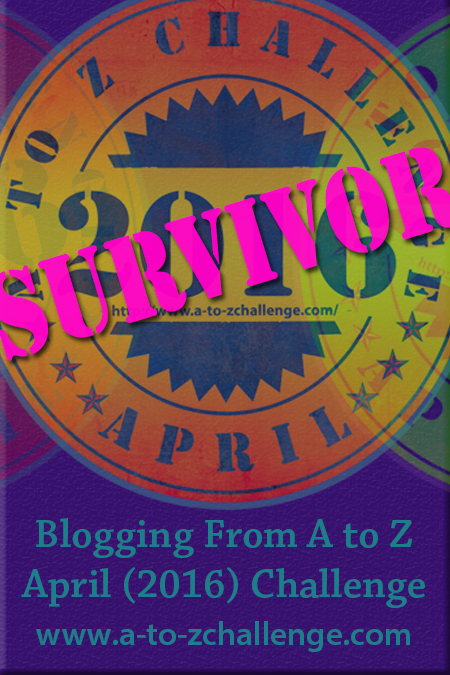 Plus I want to try to read new blogs while I’m doing this A to Z challenge. AND I’m in search of a summer job so that’s in the mix as well. It’s really just been chaos this past week and I’ve totally dropped the ball. BUT in other news, it’s the 6th which means NINE days until my birthday!! And one week until I leave for my birthday trip!! Can’t wait! Glad to know you’re still alive! To help with the clothes, try sorting them like you normally would and putting them in the wash before you start your day. Then you can come home and sort them by what hangs to dry and what does in the dryer – if they hang dry anything that is. Then it should help you conquer the massive amount! Oh that is a great tip – but I meant the kid’s laundry. And we can only do laundry from 7pm-7am during the week…basically the parents will get the clothes washed and dry and then I get a basket full of clean clothes to fold, sort, and put away. Sometimes I have time to get laundry started at night but definitely not this week. It’s something I’m going to start doing once I get my own place just because otherwise, my laundry might never get done. I love reading posts like this from you. It feels like a sit-down chat with you about what’s been going on lately. Where are you going to for your birthday trip? Somewhere nice, I hope. Have fun!! Aww thanks so much! I was trying to get that vibe across so I’m glad it worked. And I’ll be going to Ottawa from the 13th-15th. My brother lives there so we’ll just hang out for the weekend, visit a few of my favourite spots around the city and see a few of his friends. I love Ottawa and haven’t been in a few years so I’m glad I’ll be going! Ahh have you taken up archery? I have a compound bow and I LOVE it! I actually find archery to be quite relaxing in a weird way. No I haven’t – my mom wanted to and was gifted the bow as a Christmas gift two years ago. There aren’t really any places close to where she lives to take lessons so my dad got a few bails of hay from his brother’s farm and set her up with a target in their backyard. I had never tried it before so I was happy she let me use her things! And it is sooo relaxing! I loved it! It was freezing out so I didn’t stay at it for very long though. Wow, good for your mom! It takes some strength to use a bow, my poor mom couldn’t pull the string all the way back no matter how hard she tried. And Archery is so cool!!! Thankfully I just had to brush off the mud when it dried. But I hate that feeling too!! Ooh! Your new digs sound awesome!! Now that I have it all set up, its pretty awesome! Pictures going up tomorrow! Yay! Can’t wait to check them out! They are up! Check away!